Some yeasts naturally found on the surface of plums may be useful for protecting stone fruits against brown rot. At the Agricultural Research Service's Appalachian Fruit Research Station in Kearneysville, West Virginia, plant pathologist Wojciech Janisiewicz looks to the natural microflora on fruit surfaces to find potential biocontrol agents against postharvest brown rot. 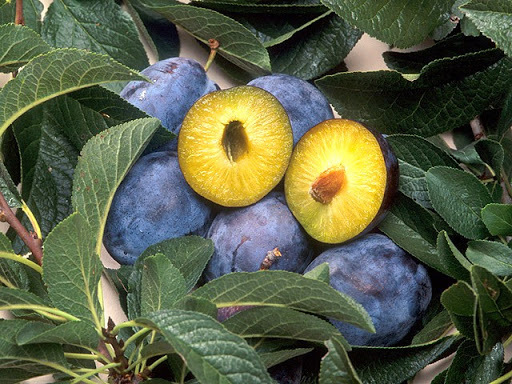 His study results show that the plum surface harbors several yeast species with excellent potential for use in biological control of brown rot of stone fruits. Brown rot is caused by the fungus Monilinia fructicola. Fruit surfaces are naturally colonized by a variety of microbes, including bacteria and yeasts. Some of those native microorganisms have been shown to have a beneficial effect on reducing fruit decay after harvest. A decade ago, Janisiewicz developed one such bacterium, naturally occurring on apples, into a commercial product for biological control of pome fruit diseases. It can be used instead of fungicides and on organic marketed fruit. Knowledge of natural microflora on fruit other than apples and grapes, however, is rudimentary, and the extent of their potential for biological control of fruit decay remains largely unknown. In recent work, says Janisiewicz, "Our team identified yeasts that naturally colonize plums from early fruit development until harvest and explored their potential for controlling postharvest brown rot, the most destructive disease of stone fruits. We determined the occurrence of yeasts on plum surfaces from the prehardening stage through harvest for 2 consecutive years. A total of 16 species from 13 genera were isolated." Three yeast genera were dominant and occurred throughout fruit development, and several other genera occurred only on more mature fruit. A few species from both dominant and less dominant genera controlled brown rot development on stone fruits after harvest in the preliminary tests. "Results indicate that the plum surface harbors several yeast species with excellent potential for use in biological control of brown rot of stone fruits," says Janisiewicz. The dominant yeast genera were Aureobasidium (24.7 percent), Rhodotorula (29.5 percent), and Sporidiobolus (24.7 percent), accounting for nearly 79 percent of all isolates. All of them occurred throughout fruit development. "The yeast species present in the final sampling were significantly different from those in the first three samplings, reflecting a rapidly changing fruit habitat during the maturation of fruit," says Janisiewicz. "Our screening of the yeasts for their ability to inhibit M. fructicola, a fungus causing brown rot, revealed a range of biocontrol activities. Several isolates provided complete control of the decay on plums. "Two of the best control candidate species were A. pullulans and R. phylloplana. Developing these yeasts into commercial products will provide growers with an alternative approach for combating brown rot after harvest that is compatible with requirements for the rapidly growing organic market. "-By Sharon Durham, Agricultural Research Service Information Staff.